Design curation is a growing field, with fashion perhaps its most popular exponent. In an era when institutions are expected to proactively engage audiences with a range of media, it makes sense that design curators are embracing the potential of the web. In recent years, the curation of modern and contemporary design has expanded in museum environments. Fashion design in particular has been an area of rapid growth in museums around the world. 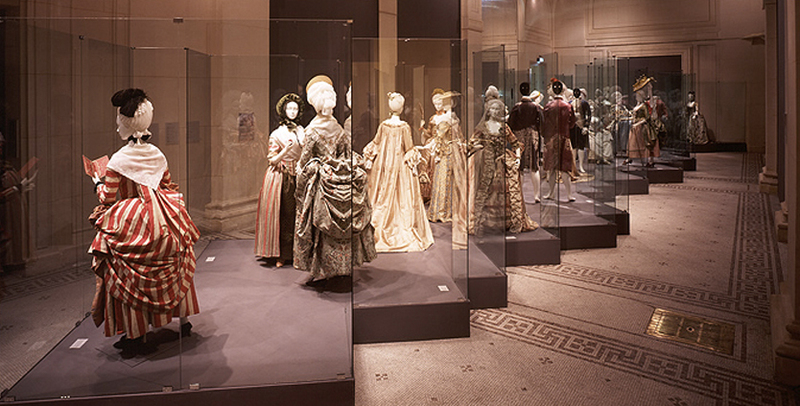 Though popular, fashion design presents distinct challenges for institutions and curators, including physical display constraints such as the need for low light levels and short display periods. Fashion also presents unique conceptual issues, as garments carry both the story of their production (the designer/maker) and their consumption (the wearer). As respected fashion historian Margaret Maynard reminds us “dress anchors us to people and their lives .” In museums, the complexities and subtleties surrounding fashion culture – the stories and memories attached to garments – can sometimes be lost in ‘dead’ displays of dressed mannequins (Wilson 1992, 1). In recent times, the rise of online museum collections has offered fashion curators in particular new strategies for engaging audiences. Some of the possibilities online collections offer curators include: the ability to show items that are too fragile for physical display; the use of macro-photography to show details that could only otherwise be viewed by handling a garment; the ability to more elaborately capture stories connected to a garment’s maker and wearer; and the raised visibility of behind-the-scenes museum and conservation practices including curator’s tours of off-display collections. There are also reciprocal advantages for viewer engagement, with online displays providing the opportunity for the public to contribute their own stories, collections and image archives. Recent examples by The Costume Institute, V&A, Fashion Institute of Technology, Europeana Fashion, and the Australian Dress Register show how the digital, in conjunction with the physical, can make fashion displays more interactive and engage a wider range of stories, contexts, media, and collections. In the process of putting together our own web-based curatorial project, The Fashion Archives, we’ve seen how an online approach can open up possibilities for telling stories on a local scale. Our website, currently in development, draws together a wide range of material artifacts and stories in an attempt to piece together the small fragments of existing information on the history of fashion in Queensland, including contemporary design. The breadth of material, taken from public collections, image archives and public and private collections around the state, will provide rich social, cultural and temporal contexts to our stories of Queensland fashion design, that we couldn’t otherwise present in a physical museum display. The question of scale and viability are perhaps the challenges that the online environment best meets. In order to curate a physical exhibition that presents an overview of Queensland fashion design (both historical and contemporary) we would as curators face a great range of challenges. These vary from finding a suitable venue; sourcing objects from countless collections; borrowing designer items – all carrying large budget requirements and display constraints. By undertaking this project predominately online, we are relatively unhindered in the amount of ‘stuff’ we can showcase, catalogue, write about and seek user stories and feedback on. While certainly not a magic-bullet in the world of fashion design curation, the online realm does undoubtedly open up the possibilities for established institutions and emerging researchers and curators alike. The web theoretically allows anyone to be a curator, and there are many great examples of what we might consider to be successful and popular online ‘citizen curation.’ What is the curator’s role when anyone with an internet connection can ‘curate’ their own website with design objects from all around the world? Does the web best suit fashion curation, due to its physical challenges? What are the limitations and challenges of presenting design, and fashion, online? What other forms of design are suited to online curation? Should institutions such as libraries and museums digitise their collections to increase audience access? Is this their responsibility as public institutions?